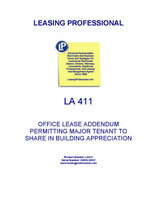 THIS LEASE ADDENDUM (the "Addendum"), is made and entered into this _____ day of ________, by and between COMMERCIAL PROPERTY LANDLORD, INC., hereinafter referred to as "Landlord," and AGREEABLE TENANT, INC., hereinafter referred to as "Tenant," and modifies that certain lease (the “Lease”) of even date herewith. 1. Tenant’s Interest in Value Appreciation. As further inducement to Tenant to enter into this Lease, and in consideration for Tenant’s agreement to perform all of its obligations pursuant to this Lease. Landlord hereby promises to pay to Tenant an amount equal to ten percent (l0%} of the Appreciation In Value of the Property, subject to Tenant’s satisfaction or the conditions precedent described in Paragraph 4, below. (a) "Appreciation In Value" shall mean the difference between Beginning Value and Ending Value. (c) "Ending Value" shall mean the fair market value of the Property as of the Valuation Date. (d) "Tenant’s Appreciation Interest" shall mean fifteen percent (15%) of the Appreciation In Value. (d) "Valuation Date" shall mean (i) the Scheduled Term Expiration Date; or, (ii) if the Term of this Lease is renewed or extended pursuant to any written agreement to renew or extend this Lease, then the date agreed upon for the termination of such renewal or extension period; or, (iii) if the Term of this Lease is terminated prior to the Scheduled Term Expiration Date or any renewal or extension thereof on the date of termination; or (iv) in the event the Property is refinanced prior to any of the foregoing dates, then upon the date such refinancing transaction is consummated. 3. Determination of Ending Value. No sooner than six (6) months prior to, nor later than one (1) month, after or within one (1) month the Valuation Date Landlord shall provide to Tenant a list of at least three (3) M.A.I. appraisers, a short written description of each of their qualifications, and their written cost bid for appraising the current fair market value of the Property. Each of said selected appraisers shall have at least 10 years experience in appraising office buildings and/or similar commercial property in downtown ____________. Within fifteen (15) days after Tenant has received such information, Tenant shall notify Landlord, in writing, of its selection of one of the three appraisers nominated by Landlord. Landlord shall thereafter engage the services of the appraiser selected by it and Tenant, for the purposes of obtaining an M.A.I. appraisal (the “Appraisal”) of the fair market value of the Property as of the Valuation Date (the “Appraised Value”) Landlord and Tenant shall each pay one-half of the fees to obtain this Appraisal. The Appraiser shall deliver a complete copy of the Appraisal to both the Landlord and the Tenant. The Ending Value shall be the Appraisal Value, less five percent (5%) of the Appraised Value, which the parties agree represents a reasonable estimate of the costs Landlord would incur if it were to sell the Property.